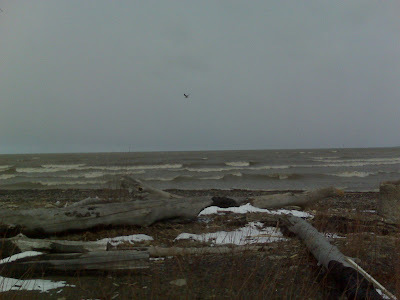 Today I made it out about 8:30 am and the lake was gusting from the West-Southwest I suppose. The winds were blowing the lake's brown color into the mouth but it was getting beat back by the green /brown color of the creek. There was a well defined mud line set up in the estuary. The water was a lot better than had been the last few days but not perfect and if we cross our fingers it will stay that way. 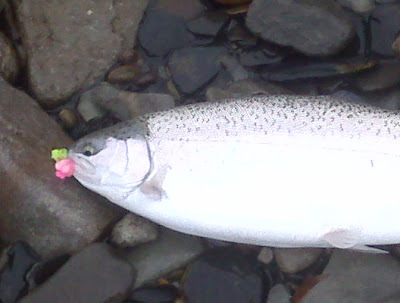 This morning's fish came on sacks in pink and chartreuse. The usual silver bullets were both aggressive and spunky. It felt good to have the sun shining and the cold wind to my back. as the sun was high in the sky I switched over to jigs and the fish would band the float down right before it got to the mud line. Due to the heavy winds it was hard not to have slack line in the water. This contributed to me losing a bunch of fish. The float would go down and I would lift up. At the same time I would reel,reel, reel, and step back wards a few steps. I would feel the head shakes on the other end of the line but if the fish charge to shore and the was still slack they would roll on the surface and pop the jig out of their mouth. Frustrating but still fun. Boy that fish is a fatty. Surprised you faired so well with the adverse conditions. Wonder if the fish are setting up on the mudline and ambushing the bait as it comes down, just like Spring time browns on Lake O.